How did two weeks slip by???? I had every intention of keeping content fresh on this blog…alas…life usually has a different idea. I will generally try my best to add new content every week but as a mother of a tween and a teenager, my time seems to be dictated by the social calendar of these two young adults. My day and sometimes night job it appears is chauffer and social/activity secretary. I did, however, find some treasures in the last week via Craigslist and wanted to share. 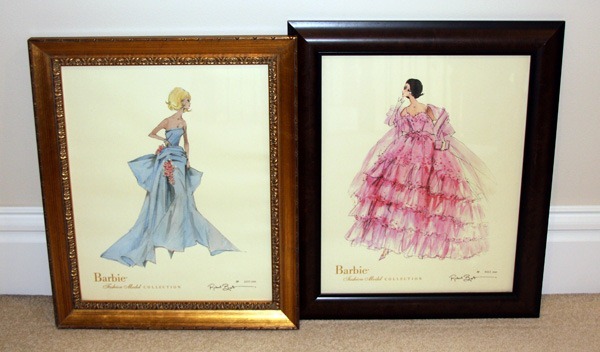 I love to collect Robert Best Barbie prints but I started late in the game. I had always wanted to find Delphine and In The Pink but wanted them at a reasonable price. I have seen them from time to time on ebay but they always sell way above what I considered “reasonable” . I just happened to be checking Craigslist the other day and noticed someone was selling these prints. It was my first Craigslist experience and I came out with some very lovely framed prints for a very good price. I am working on some photos today so hopefully will have new content soon…unless my day job turns crazy again . This entry was posted on May 7, 2011 by raberry65. It was filed under Uncategorized .